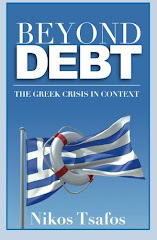 Greek Default Watch: Are Eurobonds the Answer? The case for Eurobonds is simple. Heavily indebted countries on the European periphery are finding it hard to finance their deficits at a time when lenders are demanding higher yields to be compensated for extra risk. By pooling the borrowing needs of the Eurozone, and by falling back on the credit rating of Germany, European countries would raise money more easily. The prospect of extreme borrowing costs triggering a default would almost vanish. But to judge the merits of Eurobonds, we need to ask a deeper question: what kind of a crisis is Europe facing and will Eurobonds resolve it? I would argue that Europe is facing seven interlinked crises. Crisis #1. Too much debt. Five countries have debt over GDP ratios above 90%. Together they account for 34% of the public debt of the Eurozone at year-end 2010. These countries are also continuing to run budget deficits, meaning that their debt levels are rising. Their ability to repay that debt questionable. Eurobonds as an answer? Unless paired with a haircut, Eurobonds would do little about debt. After all, Germany's debt ratio is 83% of GDP, and the Eurozone as a whole would have a debt ratio of 85%. Pooling debt together would equalize debt at a high starting point. Even so, Eurobonds would make the debt of the more heavily indebted countries more sustainable. Crisis #2. High borrowing costs. Markets are increasingly doubtful that the highly indebted countries (and a few others) have credible plans to pay back their debt. Thus, they demand higher returns to be compensated for the extra risk. As borrowing costs rise, fiscal positions deteriorate as projected debt service burdens rise. At an extreme case, when borrowing costs keep climbing, countries either default or need a bailout. Eurobonds as an answer? Borrowing costs would fall, at least initially. The collapse in spreads would make it easier for countries such as Greece, Italy, Ireland, Portugal and Spain to borrow at lower rates. However, in several countries, their debt may be unsustainable even assuming lower interest rates. Plus, it was lower interest rates (and a convergence in bond yields) that helped fuel this mess to begin with. So without further action to control spending, lower borrowing costs would be a short-lived answer with the seeds for a future crisis. Crisis #3. Fallout from a default. A default would lead to massive losses in the financial sector. That would lead to (a) a sell-off as banks seek to raise money to meet their collateral needs and (b) significant cash payments and receipts from those institutions holding credit default swaps (which insure against a default). These write-downs would likely mean that banks would need to raise fresh capital, either from the market or (more likely) from governments. Eurobonds as an answer? Again the impact would depend on whether a Eurobond is paired with restructuring. Without a haircut, the fallout would be zero (for now). A haircut could easily create a re-capitalization need even if there are Eurobonds issued. Crisis #4. Divergent economic fundamentals. There was no doubt to begin but the crisis has underscored that the German economy and the Greek economy can only belong in a fantasy common grouping in a galaxy far away. Europe faces a deep structural challenge: how to make big parts of the European economy more efficient and more competitive. Eurobonds as an answer? Technically speaking, the Eurobond, as a financing mechanism, is structural-reform-neutral. In other words, whether it leads to changes in underlying economic policy depends on the political attachments that would accompany the issuing of Eurobonds. Crisis #5. Uncertainty about German policy. When the market is pricing Greek or Irish debt, it is not clear whether, and to what extent, that debt will be backed by Germany and the richer Eurozone members. Will Germany keep bailing out the indebted countries? Will it demand a haircut (private sector involvement) in exchange for more funds? That uncertainty means that bond yields reflect both the underlying fiscal position of the debtor country as well as a reading of European politics that is changing by the day. Volatility is driven by politics not fundamentals. Eurobonds as an answer? A Eurobond would be the strongest evidence that Germany will assume Europe's bills. In fact, the volatility driven by political uncertainty would disappear. However, the timeliness of the decision would matter because the reaction of German public opinion would need to be favorable for the country's commitment to remain credible. That brings us to crisis #6. Crisis #6. Diminishing appetite in Germany for further bailouts. The German people bought into the euro under one condition: that they would not need to bailout the periphery. Ten years later, they have come to do exactly that. European debts become increasingly German debts. To add insult to injury, Germans think of Greeks (and others) as lazy and unproductive. Their desire to send checks to their brethren in the south is even less. Eurobonds as an answer? Eurobonds fundamentally abrogate the grand bargain that German policymakers made with the German public. By tying all debt together, they effectively make it impossible for Germany to *not* bailout other countries. Whether that is politically possible, in turn, depends on what reassurances the German public can get that it will not become a European ATM. Crisis #7. Insufficient political levers to manage economic policy. Europe has had no credible levers to force profligate countries to cut their deficits. Right now, it has some muscle through the provision of bailouts – it can force Greece, for example, to make myriad internal changes under the threat that the money will stop coming in and Greece’s economy would plunge further. But it has no permanent institutional measures to control how countries manage their finances (through it is talking about setting up such measures). Eurobonds as an answer? A Eurobond means that a central authority approves how debt to issue and when, effectively removing fiscal policy from the prerogative of national governments. The best way to think about this problem is to consider a spectrum of options for Europe, given that monetary policy is generated at the European level. One extreme is that fiscal policy is fully national. This is the pre-2008 approach. Each government manages its finances and issues debt to pay for its deficits. In theory, Europe could censure governments that breached the 3% deficit over GDP limit but, in practice, it never did. The other extreme is that fiscal policy is fully supra-national. A central government (in Brussels) makes decisions and settles on the flow of funds from surplus to deficit regions. National governments have lobbying power but limited spending discretion. The fully national model has two drawbacks. First, markets did not distinguish between the debt of the different countries. Countries, therefore, borrowed with impunity because the European body politic was unwilling to censure profligate members and the markets were assuming that all debt was the same. The system had neither political nor economic discipline. Drawback two is that the first drawback remains unsolved. Markets know that Greek debt is not the same as German debt. But they are not sure how different they are: will Germany step in and under what conditions? Is there some point at which Germany will refuse to keep disbursing funds? The inability to answer that question is what drives volatility - it is also what is making impossible for markets to function properly by delivering clear signals that will lead to a change in behavior (for example high interest rates leading to a curtailment in spending). The supra-national model boasts economic simplicity, but it lacks legitimacy. Governments may accept that, in exceptional circumstances, their sovereignty can be curtailed by Brussels. But to accede to a system that delegates, ad infinitum, power away from itself may be too hard to swallow. There are, of course, intermediate steps similar to the American model - there could be a balance between federal and national spending, with (constitutional) limits on the ability of national governments to run deficits. The drawback is that it assumes political deepening that probably does not exist yet. If this crisis has demonstrated anything, it is that Europeans still feel only partly European and easily fall back into national stereotypes and prejudices. In the tango that is political and economic integration, Eurobonds may be a few steps too far. Given that, the best option for Europe is to modify the pre-2008 system. There is obviously a stronger role for political pressure to limit deficits. But by being clearer on how each member's debts would be treated, and under what conditions a bailout (with a haircut) would be made available, Europe would allow markets to punish the profligate more adequately. Such a system, which has been Germany's chief position for the post 2013 architecture seems best geared to addressing the structural deficiencies of the past system without risking the overreach - and political backlash - that Eurobonds would entail. For the past several months, each time Greece is in the news regarding this issue or that, I keep saying to myself, "What's Niko's take on this?" Thanks so much for taking the time to write this you wouldn't believe how useful it is for debate.